Anita Hill is a professor of law, social policy and management and women’s studies at Brandeis University. She was born in Lone Tree, Oklahoma on July 30, 1956. A bright student, she graduated as the valedictorian of her high school class and then earned a bachelor of arts degree from Oklahoma State University in 1977. In 1980, she earned her Juris doctorate from Yale Law School. Immediately after law school Hill worked at the Law Firm of Wald, Harkader and Ross in Washington, D.C. By 1981, Hill served as counsel for the U.S. Department of Education’s Office for Civil Rights. The following year she was at the Equal Employment Opportunity Commission (EEOC). From 1983 to 1986, Hill taught at Oral Roberts University. In the fall of 1986, she joined the law faculty of the University of Oklahoma. 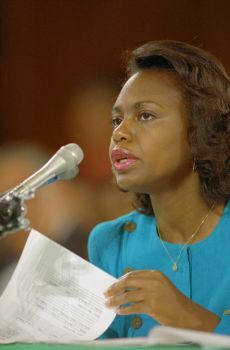 Anita Hill came to national prominence in the fall of 1991 when she was a law professor at the University Of Oklahoma School Of Law. It was during this time when Hill was thrusted into the spotlight after allegations she had made against then Supreme Court Justice nominee Clarence Thomas. On October 11, 1991 Hill was called before the Senate Judiciary Committee to discuss the charges that Thomas has sexually harassed her during the time that she worked at the EEOC. For five days, supporters and detractors of both Hill and Thomas gave frank, graphic, riveting and emotional testimony to the members of the senate judiciary committee. The hearings became landmark in that millions of Americans from all walks of life engaged in dramatic debate about sexual harassment in bars, college campuses, law firms, private homes, houses of worship, weekend retreats, upscale suburbs, downtown districts, small town America and virtually all avenues of American society. There were a number of television shows such as the CBS program Designing Women that devoted episodes to the hearings. The African American community was particularly captivated by the hearings but also deeply divided. There were those who felt Anita Hill was “airing dirty laundry” about Thomas and by implication making all black men look bad in the eyes of a white public. Other African Americans including many prominent black women supported Hill and rallied to her defense. The senate hearings eventually concluded and on October 15, 1991 the senate voted to confirm Thomas by a vote of 52-48. It was the closest margin of victory for a Supreme Court nominee in history, made so by the controversy over the sexual harassment charges. Anita Hill’s supporters argued that she helped all women by coming forth and detailing her experiences of sexual harassment. In the immediate aftermath, many corporations and institutions either revised or implemented updated guidelines in an effort to conform to more current rules regarding sexual harassment. Anita Hill, Speaking Truth to Power (New York: Doubleday, 1997); Elwood Watson, Outsiders Within: Black Women in the Legal Academy After Brown v. Board (New York: Rowman and Littlefield Publishers, 2008). v. Board (New York: Rowman and Littlefield Publishers, 2008).